Romeo y Julieta have officially released their first all Nicaraguan cigar. The words “Nicaraguan Puro” are almost always music to my ears so I could’t wait to take these out for a spin. The great staff at Altadis USA sent us over a few sticks so that we could share our thoughts on the blend with you. 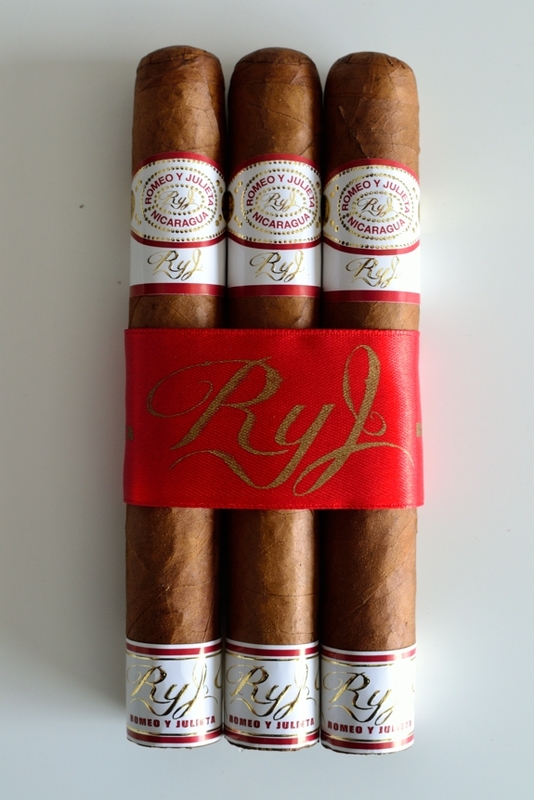 The RyJ carries a unique blend starting with a Nicaraguan Corojo wrapper grown exclusively for Altadis in the Limonera region, followed but a dual Nicaraguan binder using tobaccos grown in the Esteli and Jalapa regions, stuffed with Nicaraguan Jalapa, Esteli, and La Mia filler tobaccos. The Blend will come in three traditional sizes: Bully Grande (5 x 54), Toro (6 x 52), and Piramide (6 1/8 x 54) and will come in boxes of 20 ranging from $8 – $8.75 a stick. 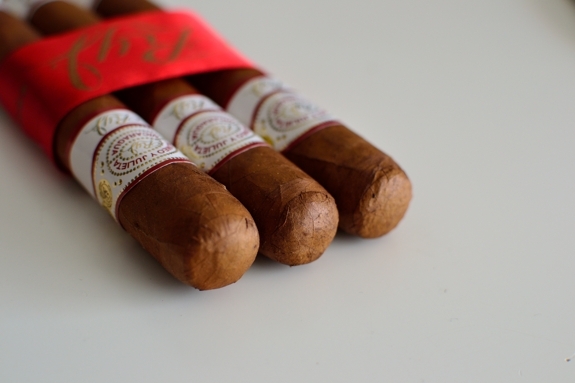 Prelight: The first thing I noticed about the RYJ was the stray from the standard Red that Romeo y Julieta likes to use on their bands. The RYJ carries a more elegant, white band with gold and red embossing. 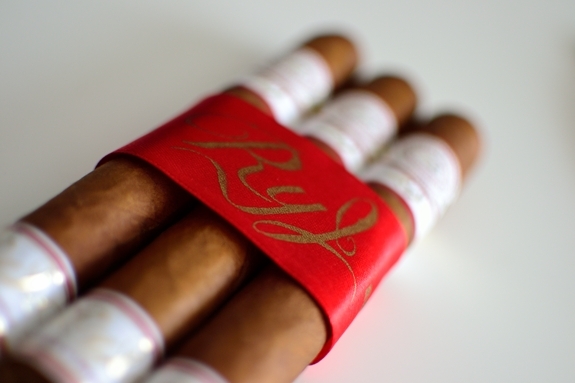 The RYJ also carries a foot band with “RYJ” elegantly embossed into it. The wrapper on the cigar has a bit of character as well. I get used to seeing consistent, shade leaf on most of Romeo y Julieta’s cigars so it was nice to see the wrapper had a lot more character. Medium brown in color with some darker webbing and orange spots with very little veins running through the body of the cigar. The cigar is capped off with a large, round, double cap. The wrapper and binder combination make for a really tough, firm feeling cigar with no signs of weakness. The wrapper gives off a really musky, cedar aroma while the foot of the cigar carries a mid tobacco/spice aroma. Flavors: Right off the bat I was greeted with something otherwise uncommon in most Romeo y Julieta cigars, black pepper. While it wasn’t powerful, it was a nice introduction to what an all Nicaraguan Romeo y Julieta has to offer. Behind the pepper laid some soft caramel, lots of earthiness and coffee, with a bit of citrus. It was a nice mixture and I was impressed with the amount of flavor I was pulling from the cigar. Halfway through the pepper dropped off completely while the coffee and cedar ramped up. By the end of the smoke the sweetness had diminished while the coffee, cedar, and earthiness had taken over. There was no harshness at all, in fact, this was probably one of the smoother cigars I had smoked in some time. Burn/Draw: During the cold draw I felt the draw was going to be rather tight. I had a bit of an issue trying to pull air through the cigar. But that wasn’t the case at all once the RYJ was lit up. The draw was perfect, pumping out a ton of smoke with every little puff. The burnline started a bit wavy, but quickly corrected itself and burned a bit thick, but perfectly even the entire experience with no extra attention from my lighter needed. Thoughts: Romeo y Julieta wasn’t the first cigar company to release a Nicaraguan Puro in the past few years and certainly won’t be the last. Personally, Nicaragua is my country of preference when it comes to tobacco. 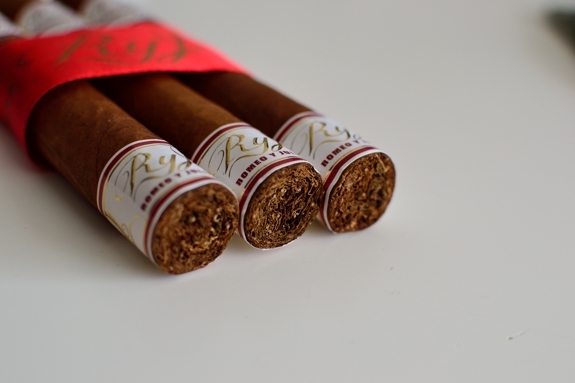 I feel some of the boldest, richest tobaccos come out of that country and the RYJ is just another example of that. Some of the other blends in the Romeo y Julieta portfolio don’t do much for me. I find most are a bit too mild for my taste. The RYJ is quite the opposite carrying a very robust profile that kept me pleased the entire experience. Mash that in with the flawless production Romeo has always produced and we have a solid cigar. If you are like me, and don’t normally go for a Romeo y Julieta due to the mild manner they usually carry, this is an ideal cigar for you. Well, this certainly sounds better than the House of Montague that I recently tried (it was sent as a freebie with a Monster order). The price, though, is in that area where a lot of outstanding sticks reside, so maybe an impulse purchase – and hopefully at a discount – rather than something to hunt down for me. Thanks for getting a review up! By the way, I didn’t receive an email notification for this post.